Being able to practice law and touch people's lives for good for more than 35 years has been a great privilege and honor for me. I've spent my entire legal career in this area, raising four children with my wife, Diane, serving the local community at every opportunity all the while trying my very best to help those who turned to me for representation in serious injury cases and criminal matters. My hallmark is my abiding, some might say compulsive, desire to truly understand and then convincingly articulate the actual effect your injuries have had on you, and your family. The law is not a job, it's a calling to which I know I've been called. I am looking forward to the opportunity to meet and work with you and your family. I've literally seen it all — and done it all — and I'm ready to do it for you, too. To learn more about me, visit the link below. I have worked hard over the years to be the most skilled at what I do. There are many who claim they can handle your personal injury or wrongful death case, but do they really have the kind of proven experience and wisdom you can trust? As an assistant prosecuting attorney, public defender and private attorney, I have tried over 100 jury trials to verdict. I've tried every kind of case, from traffic tickets to capital murder cases, from slip-and-fall to catastrophic injury and wrongful death cases. I prepare to take every client's case all the way to the courtroom, if necessary. We all need to believe in something. I believe in giving back to the community with my time and legal advice. I have also participated in many ways with The Missouri Bar to enhance the reputation of lawyers and the delivery of legal services, including pro bono attorney-client mediation and disaster relief legal counseling, and most recently serving as an elected member of The Missouri Bar's Board of Governors representing Northwest Missouri. I'm proud to say that I've been recognized by several legal industry associations for excellence, including being selected for inclusion in Missouri Super Lawyers list (2013-2017) in personal injury litigation, "Top 100" by the National Trial Lawyers Association, member of the "Top One Percent" by the National Association of Distinguished Counsel and Top 100 Trial Lawyers in Missouri. Over the years, I've earned the respect of my peers and national recognition by the legal industry. However, the trust and respect of satisfied clients remains my best form of advertising. 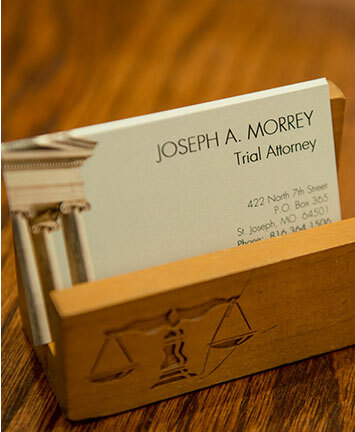 Call my law office, the Law Offices of Joseph A. Morrey, for a free consultation about your case at 816-364-1506. You can also email the firm to make your appointment. We assist clients in St. Joseph and the surrounding counties, including Kansas City, and put our experience and integrity to work for results in your case.